NASA’s Transiting Exoplanet Survey Satellite (TESS) has successfully reached its desired orbit and has begun science operations. The spacecraft was constructed by Northrop Grumman, who will operate the vehicle. This milestone sets the spacecraft on a path to continue the search for alien worlds. TESS employs four wide-field cameras that were both designed, as well as built, by MIT and MIT Lincoln Lab. These should prove critical as TESS will be used to look at distant stars and seek out the tell-tale signs of exoplanets orbiting them. Other missions that have been used in the hunt for distant worlds, such as the Hubble Space Telescope, the Kepler spacecraft as well as programs such as the Large Binocular Telescope Interferometer (LBTI) and NN-Explore that use Earth-based observatories have pushed our understanding of extra-solar planets further and further. Given the extreme distance these planets are from Earth, requires something extra to advance our knowledge to the next level. TESS will help pierce the light given off by these planet’s parent stars and to study the atmospheres that blanket these worlds. TESS has its work cut out for it – with no less than a survey of the entire sky on the spacecraft’s “to-do” list. While massive gas giants that orbit close to their “suns” appear are part of the spacecraft’s agenda, TESS will also be looking for exoplanets much like our home world. All types of stars, even pulsars have been found to have planets orbiting them. Some of these planets are bizarre with at least one being discovered that’s twice Earth’s size – and is made mostly of diamond (55 Cancri e). However it is worlds most like our own that have captured the public’s imagination. Since piercing Florida’s turbulent skies into the black, TESS has undergone a shake down process in preparation for insertion into the proper orbit to do the job it was built for. Back on May 17 TESS conducted a lunar gravity assist to provide it with the extra speed needed to help it achieve the highly-elliptical orbit that it was targeted for. This was followed by an adjustment maneuver 12 days later. This is a rather tame way in which to describe what will be the operating path the spacecraft is planned to take during its two-year long mission. TESS will carry out its work at an apogee (the furthest point of its orbit above Earth) about the same as that of the Moon (239,000 miles or 384,633 kilometers) and a perigee (the closest part of its orbit) of 67,000 miles (108,000 kilometers). So what is to stop TESS from smacking into the lunar dust? Its orbit. Every two times that the spacecraft orbits Earth – the Moon will have conducted a single orbit. In short? When it crosses the Moon’s orbital path – our nearest celestial neighbor won’t be there. Nothing lasts forever and the 2:1 resonance that TESS will have with the Moon is expected to be stable for about a decade. While TESS might be positioned in a rather exotic location, it was put together in a far more terrestrial locale – Dulles, Virginia. 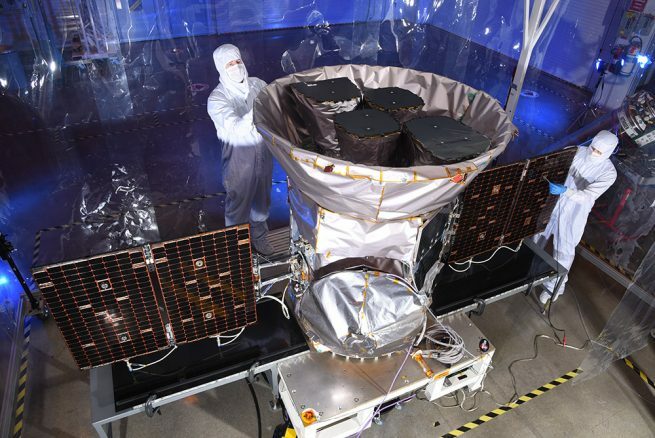 TESS is built off of Northrop Grumman’s (formerly Orbital ATK) LEOStar-2 bus, the space-based observatory was chosen by NASA along with another 11 other proposals (which was whittled down from 42 possible choices). Then, on April 5, 2013 TESS, along with the Neutron Star Interior Composition Explorer (NICER) spacecraft had received the nod by the space agency to proceed. TESS was launched from Cape Canaveral Air Force Station’s Space Launch Complex 40 in Florida on April 18, 2018 atop a SpaceX Block 4 Falcon 9 (with its B1045 first stage on its first flight).